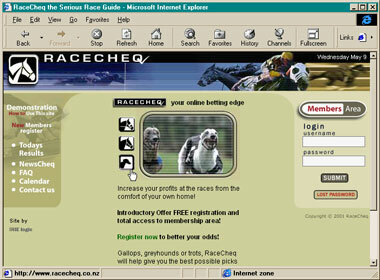 Create a website www.racecheq.co.nz to provide real-time confirmation of racing picks BEFORE the race is actually run. The site should be ISP based and provide full online eCommerce facilities for its use. The initial challenge was to provide sophisticated real-time facilities to an ISP based website along with the complex process of analysing the data prior to the race start. The process of collecting and analysing the information is achieved with 3 separate programs on 2 different platforms keeping 3 databases in tight synchronisation. 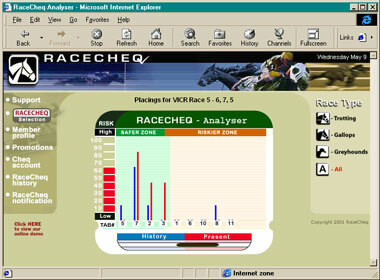 Real-time connections to the database allow the punter to view statistical analysis of the race 3 minutes prior to the commencement of the race. Complete automated client management is provided with a user registration facility and a personalised "Cheq" account that can be recharged on demand via a real-time credit card facility courtesy of Transactor 2000 (www.transactor.co.nz). Punters may view the pre-race analysis at a cost of $1 per preview. Full historical information is available to members to gauge the power of RaceCheq along with profile management and numerous value added features such as SMS and WAP notifications prior to race close.